You can edit details within your posts such as the title, description, locations, flags and more. With each new update, we aim to give you greater editing control over your posts. All of the changes you make on mobile and web will be tracked and become part of the post audit trail. Click the pencil icon on the upper right within a post to make your edits. You can change the title and description as well as add or edit recipients, location, categories and/or the post flag of a post. You’ll also be able to pin a post to a drawing, or move a pin previously placed. You can also update or edit multiple posts simultaneously from the web app - check out this article on Bulk Actions to learn more. 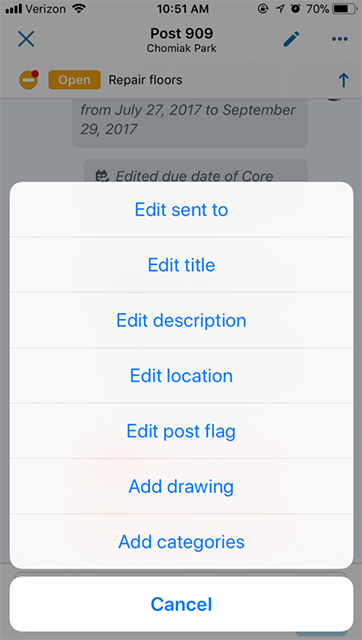 From within a post on your mobile app, tap the pencil icon from the upper right to add or edit the recipients (Sent to), title, description, location, post flag, or categories. You can also pin the post to a drawing, or move the pin placement if it’s already been added, repin it to another drawing or remove it altogether.